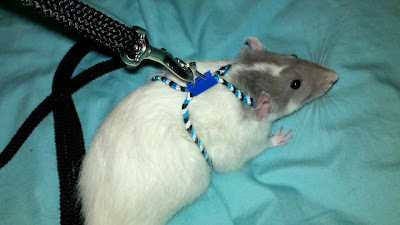 For those who were wondering how I made my rat harness, here is a series of photos and a video that explains how to weave the pattern I used. Believe it or not, it really is simple to make! 1. Measure out 60 inches of each color of embrodiery floss. 2. Gather the colors together then fold in half and knot the end where you folded. You will now have six stands to work with- two of each color. 3. Tape the bundled group of floss down, just above the knot, to a flat surface. This will keep it flat and in place. 4. Spread your stands out and decide how you want the pattern of colors to appear. For example, if you want the harness to be pink, black, white, pink, black, white…you will need to lay out your stands in that order.